But Huddersfield striker James Vaughan turned in Jack Robinson's shot midway through the second period to level. Huddersfield made a bright start but it was the hosts who created the majority of the game's early chances. Defender Steve Cook and striker Kermorgant sent headers off target for Bournemouth, who won 4-0 at Huddersfield on the opening day of the season, while Terriers goalkeeper Alex Smithies made saves from two Matt Ritchie attempts either side of Kermorgant's opener. That goal came when Matt Ritchie's corner was played in low and Harry Arter allowed the ball to run through to Kermorgant, who drilled low into the net. At the other end, Cherries goalkeeper Artur Boruc kept out Tommy Smith's curling shot, but Huddersfield chances were rare despite their continuous endeavour. And Vaughan's equaliser, his third in as many games, came against the run of play after Bournemouth had dominated possession for large spells in the opening stages of the second period. "Huddersfield came here to destruct and defend and that is hard to play against. You can look at it in two ways; you can either say it is two points dropped or it could be an important point at the end of the season. "If we had won that game three or four nil, which we should have done, everyone would be saying what a fantastic performance it was. "We weren't one of the favourites at the beginning of the season and have never said we are going to achieve anything. "We are just going about our business so I don't see why they pressure should be building." "It was a difficult proposition coming up against a team flying high but there was a lot of character displayed. "We needed that concentration and discipline and in the end we got our just rewards. "My players put their bodies on the line at times and executed the game plan." Match ends, Bournemouth 1, Huddersfield Town 1. Second Half ends, Bournemouth 1, Huddersfield Town 1. Attempt blocked. Steve Cook (Bournemouth) right footed shot from outside the box is blocked. Assisted by Ryan Fraser. Corner, Bournemouth. Conceded by Mark Hudson. Attempt blocked. Matt Ritchie (Bournemouth) left footed shot from outside the box is blocked. Assisted by Steve Cook. Corner, Huddersfield Town. Conceded by Steve Cook. Corner, Bournemouth. Conceded by Murray Wallace. Substitution, Huddersfield Town. Jonathan Hogg replaces Jacob Butterfield. Attempt missed. Jacob Butterfield (Huddersfield Town) right footed shot from outside the box misses to the left. Assisted by Ishmael Miller with a headed pass. Attempt missed. Brett Pitman (Bournemouth) left footed shot from outside the box is close, but misses to the right. Assisted by Ryan Fraser. Attempt blocked. Harry Arter (Bournemouth) left footed shot from outside the box is blocked. Assisted by Callum Wilson. Attempt saved. Steve Cook (Bournemouth) header from very close range is saved in the top left corner. Assisted by Matt Ritchie with a cross. Corner, Bournemouth. Conceded by James Vaughan. Corner, Bournemouth. Conceded by Alex Smithies. Attempt saved. Harry Arter (Bournemouth) left footed shot from outside the box is saved in the top centre of the goal. Assisted by Brett Pitman. Attempt blocked. Charlie Daniels (Bournemouth) left footed shot from the left side of the box is blocked. Assisted by Andrew Surman. Corner, Bournemouth. 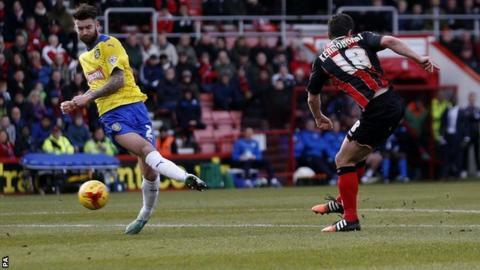 Conceded by Sean Scannell. Attempt missed. Andrew Surman (Bournemouth) left footed shot from outside the box is close, but misses to the right. Assisted by Marc Pugh. Corner, Bournemouth. Conceded by Tommy Smith. Attempt saved. Yann Kermorgant (Bournemouth) right footed shot from the centre of the box is saved in the bottom left corner. Assisted by Matt Ritchie. Goal! Bournemouth 1, Huddersfield Town 1. James Vaughan (Huddersfield Town) right footed shot from the centre of the box to the bottom right corner. Assisted by Jack Robinson. Attempt missed. Jack Robinson (Huddersfield Town) left footed shot from outside the box misses to the right.